Award winning internationally know author Martin (Brown Bear, Brown Bear, What Do You See?) teams-up with acclaimed illustrator Salerno to create this humorous tale of how a unique and colorful feather empowers a barnyard rooster. Martin successfully weaves two timely, yet wholesome, lessons into the fabric of this otherwise nonsensical story. The first being that what is perceived to be different is not necessarily better and the second that inherent individual differences merely serve to make a greater universal whole. The story opens with Chicken Chuck performing his favorite daily past-time, foraging for meals and snacks on the grounds of his “model barnyard,” so when he spotted a strange and rather large blue colored seed, he quickly gobbled it down. As soon as Chicken Chuck swallowed that seed, however, a tiny blue feather began to sprout from the middle of his forehead. All of his friends wanted to know how Chicken Chuck obtained his decorative “head-dressing,” and he proudly told them that he had eaten a special seed. “So everyone gobbled seeds and waited for blue feathers to sprout,” but nothing happened. This vivid colored feather soon became the envy and the crave of all Chicken Chuck’s barnyard friends and subsequently propels him into the “boss of the farmyard,”…that is, until the circus came to town. 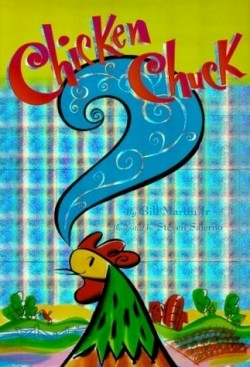 Chicken Chuck was so enjoying the constant and repeated compliments of his friends regarding his blue feather, that when they began to “ooh” and “awh” over a poster of a white circus horse with two blue feathers, he had to go see it for himself. Chicken Chuck could hardly believe his eyes, standing right before him was a beautiful white horse with two blue feathers on its head. “Oh, drumsticks, screamed Chicken Chuck, …feathers don’t grow on horses.” “Maybe they do,” said Butterfat Cow, “that horse may have eaten a (special) blue seed like the one you ate.” Chicken Chuck was much saddened by this news. His friends had started to say how much more handsome the circus horse was because it had two feathers and Chicken Chuck only had one. Chicken Chuck, however, skillfully unearths the “secret” of the horses two blue feathers; and thanks to a couple of circus “surprises” and to a monkey’s allergic reaction to blue feathers, Chicken Chuck learns a valuable lesson and soon all of his farmyard friends are sporting the object of their desire-a blue feather.